Need to speed things up? You can group any number of channels together and use just one set of pots to set the colour for all of them. There‘s a selection of colour presets to choose from, and you can switch between full and half saturation, both at the click of a single button. As well as giving you total manual control, the Stage CL‘s easy to use store features enable you to create sophisticated shows quickly and easily. Need to make a quick change on the fly? Tap the Snapshot button to save the look you have on stage. The Stage CL holds that look while you adjust any of the other controls to create your next look, then fades into it when you tap the button again. You can do just about everything without needing the screen, but when you want to get into detail, the Stage CL touch-screen display provides an easy to use interface. 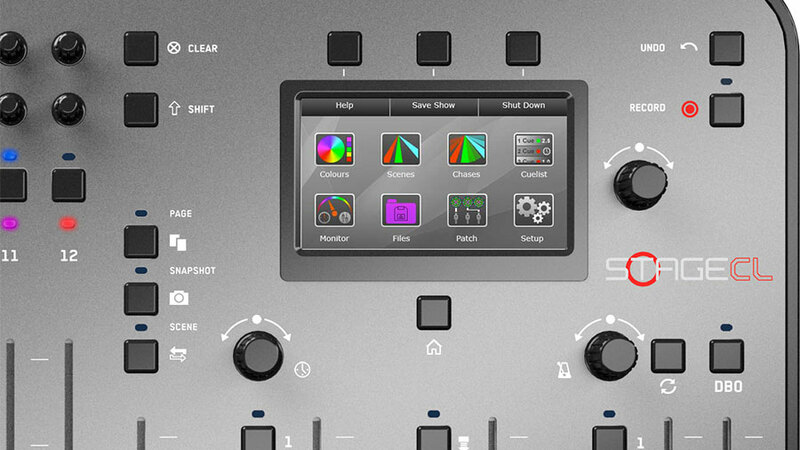 Here you can patch your lights, monitor playback, edit scenes, chases & cues, adjust fade times, apply preset colours and set up the console preferences. The Stage CL is more than a superb set of lighting controls, it looks and feels great too. 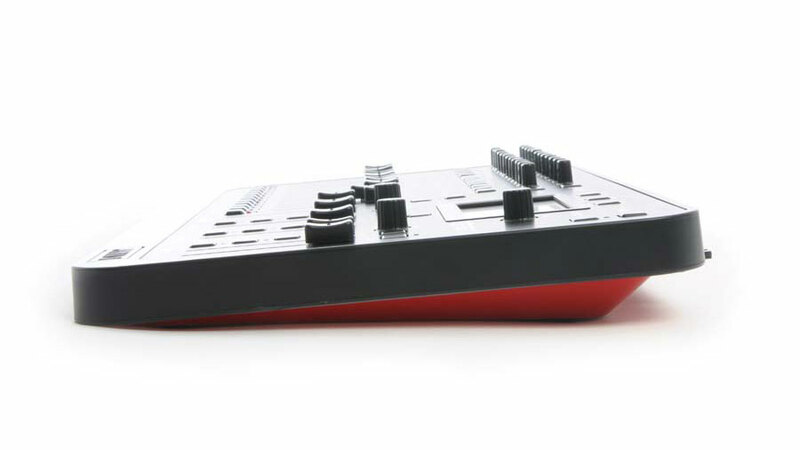 The Stage CL has high-quality 60mm faders, push-button encoders, responsive tactile buttons and multi-colour LED indicators, all packaged in a smooth and compact chassis that you can carry in one hand. 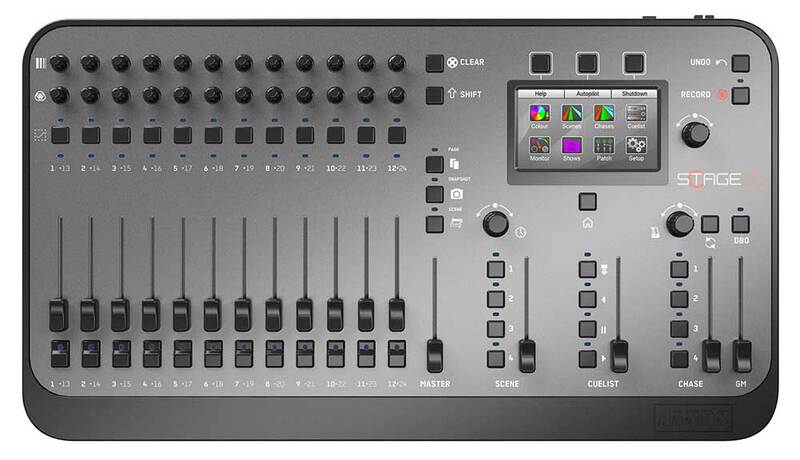 With the Stage CL you can control up to 512 DMX channels, connecting either through the DMX-512 output or the Ethernet output (if your lights support Art-net). The Stage CL literally is made for LEDs. We realised that there were lots of people out there using LED lights who were only getting a fraction of the power and flexibility these lights offer. 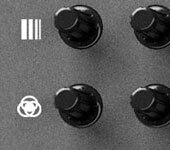 The Stage CL gives you all the manual controls and automation you need to get the most out of your LEDs. Best of all, it‘s so easy to use you don‘t need to know anything about lighting. It‘s simple really: if you use LED lights, the Stage CL is the console for you.